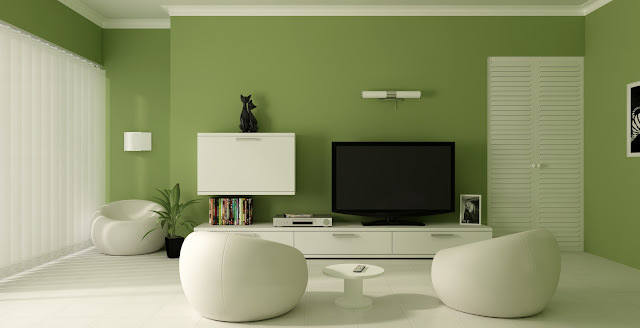 Homeowners the world over have to make a decision about what to put on the walls of their homes. Wallpaper and paint are two of the most commonly used materials, but which one is better? Wallpaper used to be something that people hated to use in their houses because it was considered to be distasteful. Nowadays wallpaper is back in, and people can’t write off the idea of using wallpaper on this basis anymore. Both wallpaper and paint have their own unique and distinct advantages and disadvantages, and this article will take a look into the pros and cons of using each material, respectively. Paint has the advantage of being cheap and easy. Almost anyone in the world can pick up a paint brush and use it effectively. With paint, you can choose from high gloss, flat and semi-gloss. Imperfections can easily be covered up using paint by simply adding more layers. Walls that are irregular can easily have these imperfections hidden by a good paint job. Painting doesn’t take much preparation either, a definite plus. When using oil-based paints, you run the risk of the paint running when it’s drying out. Oil-based paints take a long time to dry out, and they are not very heat resistant. Painting has to be done every couple of years to keep your home looking nice and it can give off harmful fumes called VOC’s. Wallpaper lasts much longer than any paint will, usually from ten to fifteen years. This not only reduces the amount of hassle involved in maintenance, it also reduces the amount of money you spend. Wallpaper also has the extra advantage of adding texture and variety to your house. Instead of a boring uniform paint job, you can create diversity with wallpaper. There are even some kinds of wallpaper that can be made to look like wood or cloth. Wall paper is more expensive than paint. It also needs to be installed, which takes more preparation. If you get tired of wallpaper, it can’t just be painted over, you will have to DE-install it first. If you damage your wallpaper, somehow, and are lucky enough to find a match to it, even though the print matches, it may not be the same color because of exposure to the sun. When you are applying new wallpaper, it is best to remove the old paper first instead of putting more paper on top. You can have the best of both worlds by adding the texture and diversity to rooms that you want to see wallpaper in and leaving it out in the ones you do not. Most people mistakenly think that every room in the house has to look identical. This could not be any further from the truth, in fact, a home looks better when not every single room looks uniform. Each room can have its own theme. Make some rooms with paint and some with wallpaper and get the best of both worlds.